Vinton and Mary Englehardt accepted a letter and Eads Bucks from President Dennis Pearson and Vice President John Courkamp welcoming them as members of the Eads Chamber of Commerce. Vinton was a former house builder and owns many homes in Eads, now has added two new businesses. He and his wife built new storage units during the summer and now have 36 spaces to rent in their STUFF AND STORE place on Goff Street and Highway 287. The Engelhard's bought the metal for the building frames from Brandon Hoffman's "7 one 9 Metal Works" in Eads and they bought the siding and roofing from the NAPA Hardware Store here in Eads. Vinton's other business is Metal Art which is large flat pieces of art, that are mostly western designs cut with a plasma cutter. Some of these art pieces are displayed near the Storage Units that have four colors of doors. 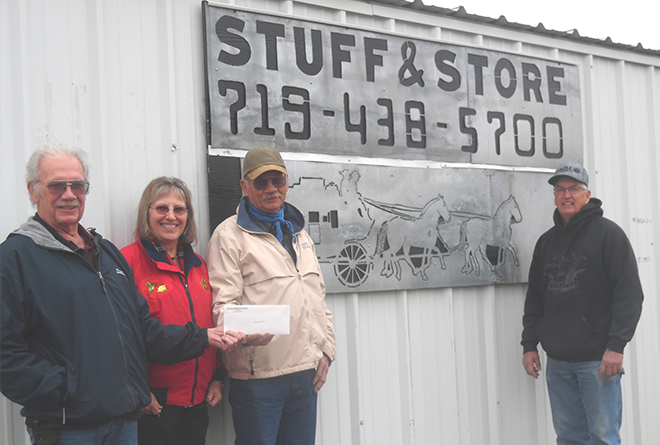 Pictured (l-r): Dennis Pearson, Mary Englehardt, Vinton Englehardt, John Courkamp. Courtesy Doris Lessenden.